Justin Hale won Kentucky’s first gold medal of these USA Games. 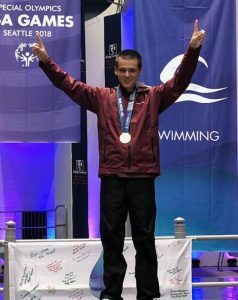 Louisville swimmer Justin Hale became the first Kentucky swimmer at these USA Games to win gold when he topped his division of the 100-meter freestyle today. Hale finished in a personal best time of 1:20.44. and was nearly 10 seconds faster than silver medalist Jackson Mayor of Washington. It was Hale’s first individual event in his first USA Games. Caitlin Roy – another Louisville athlete competing in their first USA Games – added a gold medal to the silver she won yesterday in the 100-meters. She won her heat of the 200-meter dash in an impressive 33.60 seconds. It was a personal best and the second fastest 200 meters overall for women at the event. She won her heat by just over a second over Arianna Bamsey of South Dakota. Kentucky gymnasts also once again went big as they returned to Seattle Pacific University for the vault and beam individual apparatus events. Tonya Cornett of Lexington claimed gold in both events adding to the all-around gold she won yesterday. Cornett won her division of the vault with a score of 19.15, nearly three points better than silver medalist Devon Anderson of Texas. A bobble on the beam cost Cornett the outright gold in the event, but her score of 18.23 was enough for her to share gold with Ashley Jones of Illinois. Cornett was joined atop the medal stand by Lexington’s Aliya White and Ludlow’s Jennifer Rhein. White finished fourth in her vault heat with a score of 16.59, a little more than a point out of the bronze medal. She followed that performance with a spectacular routine on the balance beam, scoring 18.58 and edging silver medalist Krysta Perez of Florida by just .03 points. White was overcome with emotion on the awards stand, tearing up as her gold medal was presented. 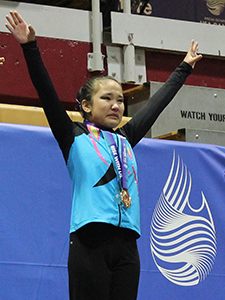 Rhein, who also won her division of the all-around yesterday, posted one of the highest scores of the day at any level in the balance beam, with a 19.43 to beat silver medalist Tasjenay Feigh of Minnesota by 1.33 points. In the vault, Rhein scored an 18.93, but Feigh got the better of her with a 19.38. Aliya White was overcome with emotion when she realized she had won her first ever USA Games gold medal. Lee Dockins of Russellville added a pair of silver medals to the all-around gold she won yesterday as well. Dockins took silver in both the vault and balance beam events. Her vault score of 17.05 was .68 points behind Madeline Csont of New York. She went on to score a 16.78 on the beam, just .3 points shy of a gold medal in that event. Danielle Blakeney of Erlanger, who won bronze in the all-around yesterday took home a fourth and a sixth place ribbon today. Her vault scored a 12.89 to finish sixth. Her beam routine scored a 16.16 – a personal best, just missing a bronze medal by .37. 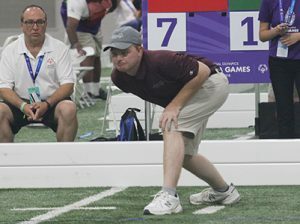 At the bocce venue, athlete Brett Thompson and his dad and Unified partner Jeff of Rockport won the first Unified USA Games medal in any sport in Special Olympics Kentucky history when they claimed the silver in the Unified doubles event. The Thompsons cruised in their pool play matches 11-3 and 12-3 to reach the gold medal match. They jumped out to an early lead over father and son team Joe and David Johs of North Dakota, but the Johses chipped away and scored in the last round to win 8-7 in an outstanding match by both teams. The Unified doubles match was one of two silver medals Kentucky earned in bocce today. Cindy Cusick – who won silver in the singles event – and Kathleen Crumbo of Louisville won their early match in the doubles event this morning to qualify for the gold medal match, but they ran into a buzzsaw in Tara Sanders and Katie Muench of Wisconsin, losing 12-1 to bring home the silver medal. Both Cusick and Crumbo have completed their competition at the Games. In other track action, Ryan Barts of Georgetown closed out his second USA Games appearance with a bronze medal and a fourth place. He took bronze in the long jump with a leap of 4.56 meters. He was .37 meters behind silver medalist Charles Fullerton of West Virginia. New Hampshire’s Bayzil Moreau won gold. Barts placed fourth in his heat of the 400-meter run, finishing in a personal-best time of 1:01.61, just over two seconds behind bronze medalist Albert Dorsey. James Dawson of Idaho took the gold. Brett Thompson and his dad and Unified partner Jeff won SpecialOlympics Kentucky’s first ever Unified USA Games medal. At the pool, Megan McCormick of Lexington made a massive charge at the end of her heat of the 100-meter freestyle, but ran out of room to catch gold medalist Sofia Walhovd of Wisconsin. McCormick finished in a personal best 1:35.13, just .22 seconds out of first in the fastest heat of the day. Cassie Wright of Louisville earned a fourth place ribbon in the 100-meter freestyle, finishing in 1:57.22, seven seconds behind bronze medalist Katie Worrell of Minnesota. Hunter Eudy of Independence finished sixth in his heat of the 100-meter freestyle. He swam a personal best 1:17.58, just .02 seconds out of fourth and less than three seconds behind bronze medalist Adam Smith of Pennsylvania. Eudy, Hale, McCormick and Wright also teamed up to take bronze in their heat of the 4×50-meter medley relay. They swam a team-best time of 3:20.56, but after yesterday’s fast preliminary swim they were bumped to a higher division and couldn’t catch silver medalist Colorado. The golf competition ended today with all Kentucky golfers earning medals. Jude Zilliox of Alexandria closed out the 9-hole individual stroke play competition with a final round 61 and a silver medal. His three-day total of 181 left him seven shots behind gold medalist Danny Dasis of Mississippi in his flight. After a hole in one by Unified partner Dennis Gaines yesterday, Gaines and athlete Wake Mullins fired a final round 85 today. It was the lowest round of the day and included three birdies. Mullins and Gaines made a charge for the silver medal but fell one stroke short and will bring home the bronze in the event’s top flight. Kentucky’s bowlers – Michelle Barnes of Carrollton, Kelly Kunisch of Elizabethtown, Joseph Jarrell of Olive Hill and Daniel Williams of Glasgow – placed fourth in the team bowling event. They combined to bowl a 1,131 series, finishing just 73 pins behind the bronze medalists from Delaware and only 76 pins behind Mississippi, who took the silver. The team event completed their competition. Both of Kentucky’s team sports had similar days. After dominating pool play early in the week, both basketball and flag football were bumped up a division for medal play. Both were very competitive, but eventually fell in their semifinal game. Flag football fell behind Iowa in their game and could never quite get over the hump, falling 14-6, by far their lowest scoring game of the tournament. Basketball led Georgia at halftime, but fell behind in the second half, and an injury to Zach Lindsay left them unable to mount the comeback. They eventually fell 33-22, despite eight points from Ray Smith. Caitlin Roy will have her final shot at another medal when she runs the 400-meters. All five gymnasts are back in action when they compete in the uneven bars and floor exercise individual apparatus events. Flag football and basketball both compete for bronze medals. Football will take on Idaho and basketball will take on Oregon. Swimmers Justin Hale and Hunter Eudy will both swim the 50-meter freestyle and Megan McCormick will swim the 100-meter butterfly. In addition, the Kentucky gymnasts will be featured on tomorrow night’s ESPN2 nightly recap show. They will show a feature the “Fab Five” did with Julie Foudy in May and they will have footage from today’s competition and an interview with Holly Rowe.